After a 121-110 loss to the Nets on Thursday, the Knicks have the 7th worst record in the league at 27-42. It was the Knicks’ 2nd loss in 5 days against the league-worst Nets. Even more astonishing is the fact that New York hasn’t won consecutive games since December, December 20th and 22nd to be exact. Let me reiterate that, the KNICKS HAVE NOT WON 2 GAMES IN A ROW SINCE DECEMBER. Quite the drop off for a team that was 16-13 after that December 22nd victory over Orlando. Anyway, you all know that this team is as enigmatic as ever so I’ll stop blabbering about their unprecedented slide. After Thursday’s loss, Carmelo Anthony acknowledged that this is one of the worst seasons he’s had in the Orange and Blue given the expectations but while he rightfully sounds dejected, Knicks fans should be bubbling with joy after each loss. The reason: the Knicks are actually in possession of their first round pick. It cannot be overstated how much potential exists within this year’s draft class, so much so that it compares to 2003’s legendary talent pool. There are numerous potential franchise cornerstone players, and many happen to be point guards, a potentially vacant position for the Knicks after the season. It should be very clear that Derrick Rose is a failed experiment and will never be worth a max contract given his reckless style, lack of perimeter shooting, and abominable defense. What should be equally clear is the need to pair another great talent with rising star Kristaps Porzingis, who has shown his own deficiencies, particularly in the post, this season. The expected crop of point guards in this year’s class include Washington’s Markelle Fultz, UCLA’s Lonzo Ball, Kentucky’s De’Aaron Fox, NC State’s Dennis Smith, and France’s Frank Ntilikina. Fultz and Ball are the leaders of the pack but all present potential for a team devoid of it in the Knicks. Despite the uncertainty that comes with the lottery, the Knicks, right now, are unlikely to obtain Fultz or Ball, the projected first two overall picks. Don’t worry though, there’s hope for more losing! The Knicks embark on a 4 game road trip out West tonight, starting with the struggling Clippers. The remaining 3 games of the trip are against Utah, Portland, and San Antonio, all superior teams to say the least. In addition, of the remaining 13 games, the Knicks face just 3 teams not currently in the playoffs (Miami, Chicago, and Philadelphia). So, as I said, there’s hope. Sure, I know many will declare it disgraceful to root against your own team and believe in “tanking.” You know what’s also disgraceful? This team, and even more so, shortsightedness. Brutal honesty is necessary to be a successful organization. Is it disgraceful to have a long-term vision? Is it disgraceful to strive for sustainable success? Because that’s the aim of “tanking.” Sometimes the best option is cutting your losses and acknowledging your mistakes. That’s what the Knicks desperately need to do. 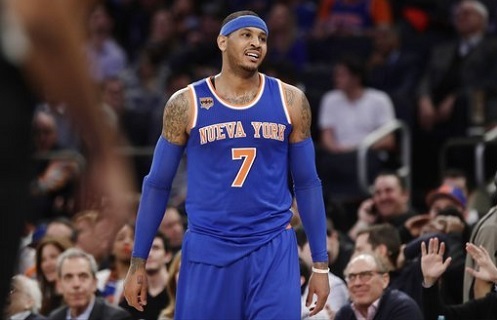 The Knicks took a shortcut to success and it backfired, as shortcuts usually do. Now it’s time to do this the right way and build through the draft. It paid off for Golden State, Oklahoma City, and potentially Philadelphia. If the Knicks are patient, it just may pay off for them too. So, the next time the Knicks lose, smile. I know it’s hard to do but just realize, it may actually lead to relevance again.